Butter: How Much is Too Much to Eat ? 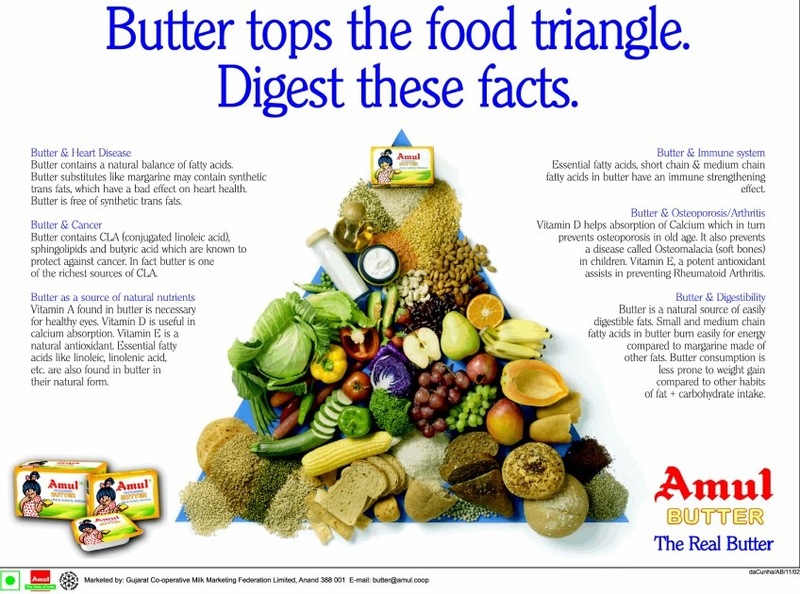 Recently, Gujarat Cooperative Milk Marketing Federation marketing the popular ‘Amul’ butter in India advertised in newspapers (image on the right), the advantages of butter. 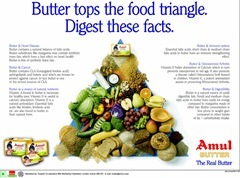 But the advertisement, did not highlight how much butter is too much to eat. Our food has two main types of fat – saturated and unsaturated. 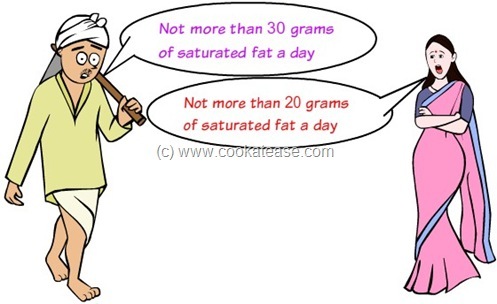 Both type of fats have same amount of calories. Butter has saturated fat. As saturated fat can increase our cholesterol (thus increasing the risk of heart disease), it is better to reduce intake of food that is high in saturated fat. Then how much saturated fat is too much to eat ? For average men, it is not more than 30 grams a day. For average women, it is not more than 20 grams a day. Read more from NHS Choices: Fat – the facts. Quite informative post..thanx for sharing. How to prepare Mor-Milaga vathal? thanks for ur kind information.inshaallah i will follow this. I think you are seriously wrong in telling people not to et a lot of butter. The fat which you eat does not cause cholesterol to rise and neither will it put on a lot of weight. Sugar and carbohydrates are what the scientists now have found to be the root of the problem for human beings. I would highly recommend your readers research the LCHF lifestyle plan and learn about where the scientist got it all wrong and caused us to get fatter and sicker.